It’s not often that something innovative comes to the world of women’s manual shavers. Most of the advances have been to the blade cartridge—more blades and moisture strips. But, Gillette’s next generation Venus Swirl™ Razor has a new technology that will change the way you shave. The advancement is a rotating joint, called the FLEXIBALL™. The Venus Swirl™ Razor twists from side to side with a 36-degree angle of rotation (the men’s Fusion ProGlide with FlexBall Technology has a 24-degree range), as well as having a blade cartridge that pivots up and down. This wider range of motion means more constant contact with your skin, fewer missed hairs and a closer shave, especially around knees and other bumpy and curvy areas. For instance, take my knees. When I shave, it usually takes a number of passes to ensure a close shave. But with the twisting action of the FLEXIBALL™, I can cover more area in one pass. And, for me, fewer passes means less chance of a careless nick. In addition to the FLEXIBALL™ joint, the Venus Swirl™ razor cartridges come with a new 41-prong MicroFine Comb that helps guide hair toward the 5 blades, to prevent hair from being pinned down and missed by the blades. And, like other Venus cartridges, the Venus Swirl™ features two lubricating strips for enhanced glide. 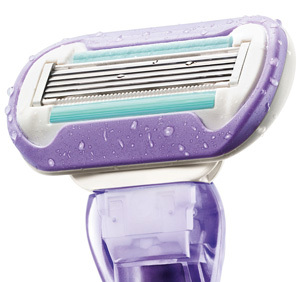 The Venus Swirl™ Razor’s handle has a thick, textured no-slip grip, which makes it easy to handle when wet. And, the curved handle ensures that both the blades and the moisture strip in the razor cartridge don’t make contact with your tub or sink when you set the razor down—no gooey mess. The Venus Swirl™ Razor will be available at food, drug and mass merchandise stores nationwide and sold in a package that contains the handle and two Swirl Razor cartridges for $12.59.